The new set up and so far .. I love it. And look at all the room in front of the bench where I can set my project. My back will be to the tool cabinet ..
instead of toward the camera. This entry was posted in workbench, workshop and tagged Shop set up. Bookmark the permalink. 9 Responses to Doh! Shop Space epiphany! Howdy, Hope all is well. I’ve been setting up shops for years, and in my current shop for three. I still re arrange constantly, moving this and that to improve some access to a machine, or improve work flow. It’s an ongoing process. And a good opportunity to clean. I had mine against the wall like the Schwarz recommends, but I just moved it so that the short end is against the wall instead of the back end. This way I can have larger panels, drawers, and things sit on my workbench without them banging against the wall. So far so good. It is surprising how willing some of us are to push our benches to one side to create more space for the likes of a table saw… Yet, in my opinion, the workbench is a heart of a workshop. It’s absolutely the heart of mine. 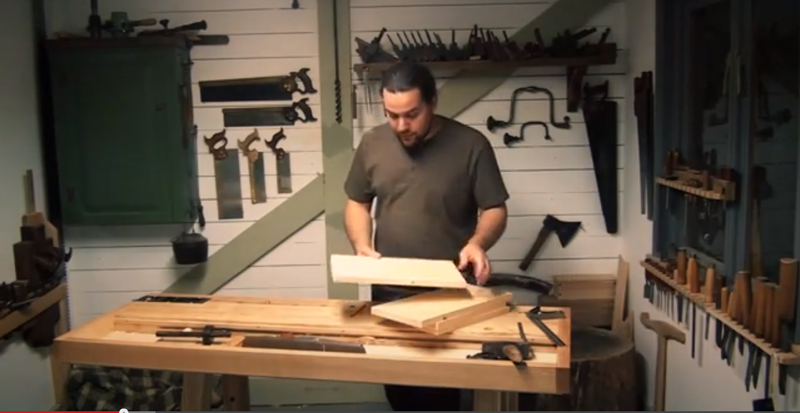 How much space do you have between your bench and your wall of tools? I’m thinking of giving this a try. 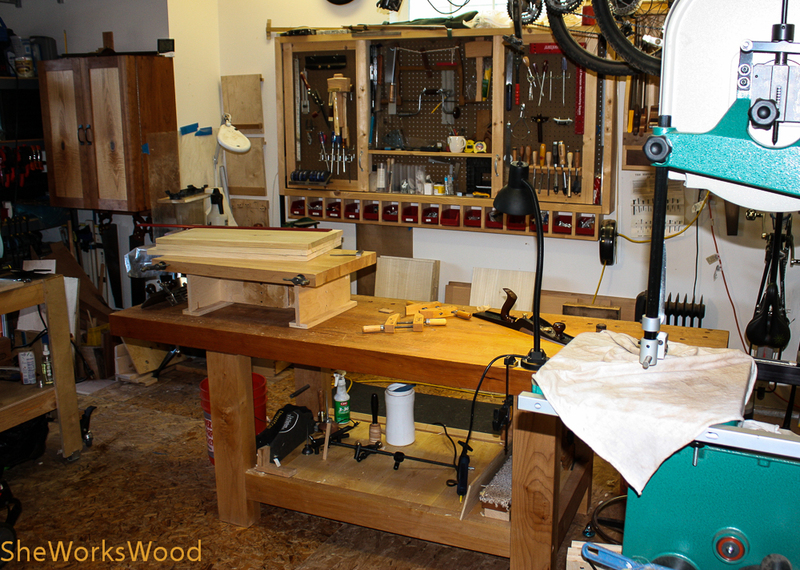 My shop space is rather narrow, so I’m not sure if I have the room to keep my bench away from the wall. I can vary the space by simply pushing the bench out. But, normally I’ll have about 3 1/2 to 4 feet behind me to allow me to put my foot back while sawing or cross planing. I could also got to the other side of the bench to get more space if needed since that side is open. 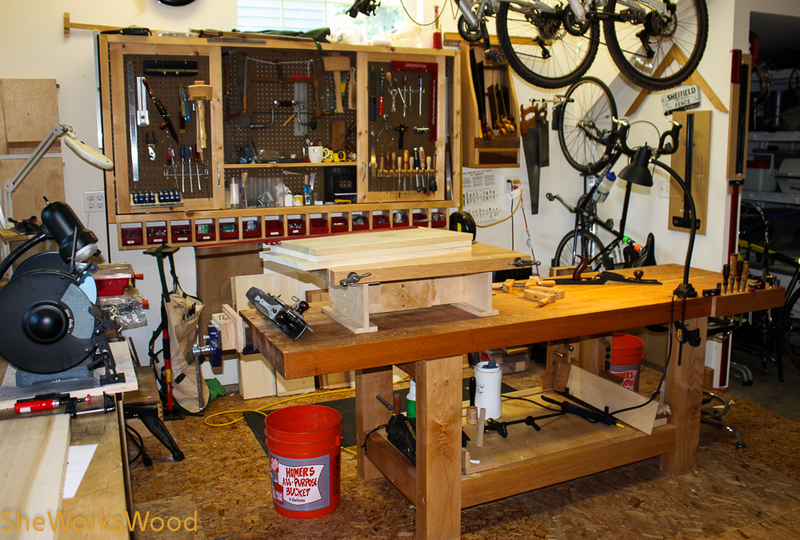 What moving my bench to this location does most for me is open up space for my projects on the back side of the bench and move the tools on the back wall closer to me. The ends of my bench will be a bit cramped but so far I really like the set up. Nice setup and great blog Marilyn. I caught your mention on Richards blog, recognised the name from the WW Guild site and Woodtalkonline and had to come over to say hi. I have mine about 12″ away from a wall with a window in. My tool rack goes across the window (a la Chris Schwarz’s rack) and I can reach it fine. I still get loads of natural light and I’m not staring at a blank wall. The reason it is 12″ away was I found that when it was against the wall I sometimes would catch the tools in the rack if I had something large on the bench. Cross planing hitting the wall is not a problem due to that 12″ too. I can also pull the bench into the shop, if desired, as I have a jackup caster mechanism that I attached to it. Up to now I’ve not needed to move the bench or reposition it but it seems to work fine for you and gives me food for thought. Sounds like you have the perfect set up especially with the window. I have a window but its about 8′ up. Good light, good to keep the burglars out but not so much for lookin’ out the window. Best feature of any workbench in my opinion. Being able to swing around to the “back” opens up a lot of possibilities. I work off the end of my bench a lot with fenced planes and being able to move to the other end and work from the back can keep me working with the grain. In the end you don’t need a huge amount of space between the wall and the bench if you designate that side as the “back” and work primarily on the “front”. But I think you will find at least once in every project a reason to work from the other side. Good move!